Everything, from land and water to health and human rights, is intimately linked to the issue of ‘free trade’. 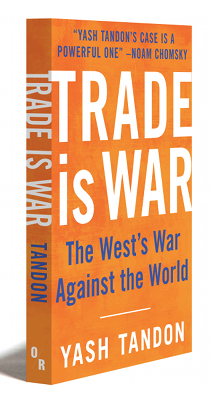 But Professor Tandon, author of the recently published Trade is War, asserts that in fact free trade is far from benign. Rather, it is deeply Eurocentric to think that because trade enriches the West it also works for the rest of the world. Instead, for the vast majority of people, and especially for the poorer regions of the globe, free trade not only hinders development – it causes relentless waves of violence and impoverishment, and continues to serve as a weapon for plunder and exploitation. Yash Tandon, isthe author of numerous books, andis Honorary Professor at Warwick and London Middlesex University. He is the Founder-Chairman of SEATINI (Southern and Eastern African Trade Information and Negotiations Institute), and former Executive Director of the South Centre, a think tank of the Global South. This entry was posted in 2015 and tagged Yash Tandon. Bookmark the permalink. ← Climate Change – What will happen after the decisions in Paris?